Weed Suppression. For anyone with a deficit of time or a bad back — or just those who like to lord it over others for their lack of weeds — this is a big deal. If I told you that you could practically eliminate the need for weeding in your garden by planting more plants, wouldn’t you be thrilled? It’s far better to have a lovely plant you selected covering bare soil rather than an invader with nefarious tendencies. Prevention of Moisture Loss. Shading the soil in our warm, dry summer conditions helps moisture that you do add stay put longer, and prevents accelerated evaporation. And many ground covers are drought tolerant, so you’re not adding something else that needs additional water. Water is a precious resource (Even here in the PNW! ), so let’s treat it like one. Beautification. 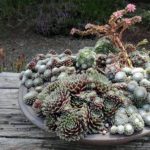 Ground cover gives you an easy way to knit together different parts of your garden with a common design element and, just like larger plants, they provide color, texture, scent, and interest throughout the year. This includes on slopes that can be difficult to plant, but where your ground cover will do the soil retention work for you and help prevent erosion. Pollinator Benefit. Most ground covers bloom, and they often provide pollen and scent that attract beneficial insects, further increasing the biodiversity in your garden. Low Maintenance Gardening. By choosing ground covers that aren’t overly ambitious (I’m looking at you, Vinca! 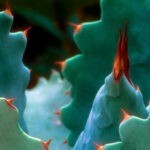 ), you are adding a layer to your garden that requires nothing from you while giving you all of the above benefits. But what do I mean by ground cover? I’m referring to perennial (often evergreen), low-growing, spreading plants that tend to hug the ground, from just above soil level to around 18″ high. They tend to slowly form a mat over the soil and play well with others, growing easily around larger plants and mingling happily with their neighbors, including bulbs. You can also use free-standing plants (sedge, heuchera, ferns, etc..) as ground cover when densely planted in a matrix. From hot, sun-baked areas, to dry shade, there’s a ground cover for every situation. 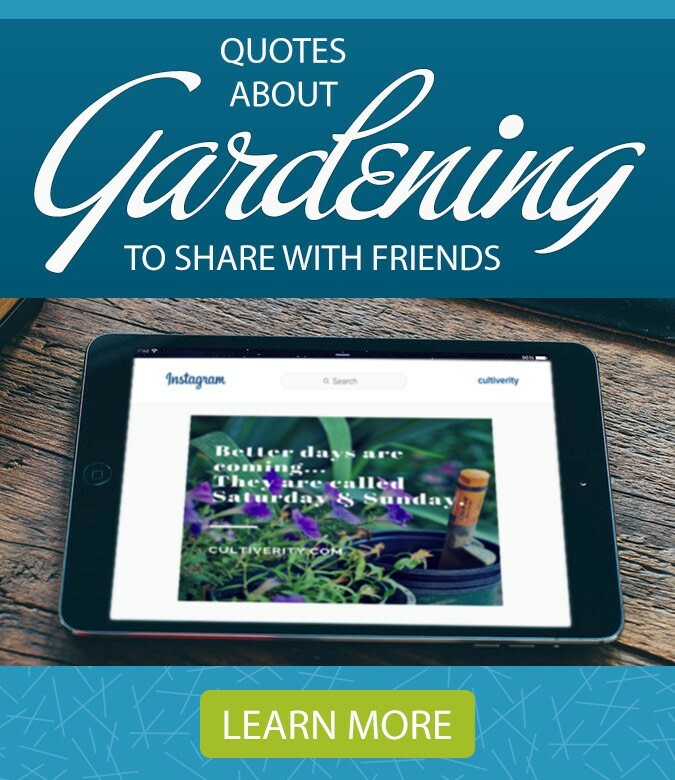 There are currently 2165 options when searching for ground covers up to Zone 8a on PlantLust.com, so there really is something for everyone. I use ground cover throughout our hellstrips (seen above) where they provide interest and color while being drought, dog and foot-traffic tolerant. I also have to worry less about them spreading to areas where I might not want them as they’re contained on all sides. I was recently at Longwood Gardens in Pennsylvania where this woodland garden had a wonderful tapestry of ground cover in an area recently exposed by the loss of a deciduous tree. There’s lots of Cinnamon Fern (Osmundastrum cinnamomeum) and Tiarella, and I was reminded how great ferns are at covering ground, especially in shade. Also at Longwood, but for a hot, sunny site, is this wonderful combo of silvery leaves. Obviously this particular combination isn’t hardy for us, but sempervivum can give you a similar effect with other hardy options. I was also lucky enough to visit the Highline in New York City, where there was ground cover everywhere you looked, forming a gorgeous matrix of plants that carried themes from area to area. Here’s a particularly beautiful combo of Carex and Heuchera with Fringe Cup (Tellima grandiflora) growing in a minimal amount of soil and handling the conditions there beautifully. If you have a spot that stays relatively moist in summer, you might consider Hardy Impatiens (Impatiens omeiana). Here it’s seen in the garden of Vanessa Gardner Nagel mingling with Japanese Forest Grass (Hakonechloa macra), where it lights up a shady area. The garden of Vanessa Gardner Nagel. Hosta is also a wonderful ground cover, from big to small, it can cover large areas in warmer months. Epimedium can give you beauty in a dry shade spot. You can even use annuals to cover ground either temporarily or as part of an ever-changing display. I always plant some Sweet Alyssum (Lobularia maritima) in my garden because the bees love it so much. I also rely on California Poppy (Eschscholzia californica) in sunny areas that aren’t yet ready for a final planting because they’re so easy to grow from seed, and they’re cheerful and easy to rip out when you’re ready to move on. I like to mix in other colors with the traditional orange. If you look carefully in the photo below, you can also see a self-seeded Castor Bean (Ricinus communis) that will dominate this space later in the season. I also use ground cover in my container plantings. Just as they shade the soil and smother weeds in the ground, they do the same thing in containers. They can also echo the colors of the main containerized plant, provide a cascade down the side of a pot, and/or give you some textural contrast. On the left we have Miniature Daisy (Bellium minutum), followed by Miniature Lady’s Mantle (Alchemilla ellenbeckii), with Euonymus fortunei ‘Wolong Ghost’ in the back. These three underplant a silver-leaved Mahonia. Underplanting a containerized Stewartia tree there is an annual Euphorbia, a variegated and evergreen Carex, and a white-flowered Begonia. 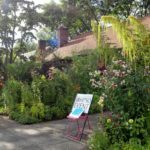 Finally, here are some photos from my own garden (a 50×100′ Inner SE Portland City lot), where you can see how I use ground cover throughout — in sun and shade, to knit together plantings, to provide seasonal color, and to cover any and all exposed ground. A semi-shaded bed under a giant Ceanothus on the north side of the house. Just inside a 6′ fence on the southern property line. In the shade of a birch tree. In this sunny spot in the back garden these dianthus nestle up to Euphorbia ‘Glacier Blue’ — they perfume our whole back garden. In our sunny front garden this combo of Hebe and Calluna Vulgaris act as a taller ground cover adjacent to a path. Saddling our front garden’s bioswale (that is only exposed in colder months) there are graduated layers of ground cover that increase seamlessly into a shrub layer. Dwarf Lamb’s Ears (Stachys byzantina ‘Silky Fleece’) is a great textural contrast to other nearby plants and much nicer as a small garden plant than the larger variety. Sedum is an easy, happy ground cover in Portland-area gardens. I mix it with Wooly Thyme, New Zealand Purple Burr (Acaena inermis ‘Purpurea’), and other ground covers throughout my front garden and let them duke it out. Sedum ‘Angelina’, shown here, gets a lovely bronze cast to its foliage in winter. Here we see the Dwarf Stachys again along with Silene uniflora (with the white flowers) nestled up against some Dianthus. The echo of silver/blue colors can be found throughout the garden. I usually plant larger shrubs as small specimens to be able to afford my habit of plant collecting, so I often plant ground covers between them to make the garden more interesting from the get-go. As the shrubs grow, the ground covers either get moved, or adjust to the smaller space available to them. If your garden is large, you can think on a larger scale with larger areas of the same plant, and even larger-sized plants as ground cover. If your garden is small, ground cover allows you to experiment with color and texture throughout your garden without taking up much space. Even if you’re gardening on a balcony, ground cover in containers can enhance any display. I encourage you to think of ground cover as a living mulch. There is certainly a place for mulch like bark, or gravel, or hazelnut shells (etc..), but those don’t have to be a long-term solution. Those mulches are perfect when you’ve created a new bed and there’s lots of space between your plants when they’re quite small — they too will help you smother weeds and retain soil moisture — but to see them as an annual addition to your garden is an unnecessary expenditure of time, money, and natural resources. Personally, I’d much rather plant ground cover and enjoy its usefulness, and beauty, over time. Mixed Sedum with Dianthus and Acaena microphylla. Great article, Kate. Love all the gorgeous pics of such inspiring combos. I was just pondering this issue as some of my ground covers (Dicentra Formosa (bleeding heart), cyclamen etc.) I noticed you have a photo of chameleon plant (Houttuynia cordata), just above the discussion of thugs. This one for sure is a total thug. Sure, its red, yellow and green leaves are beautiful but this plant is a major pain in a moist garden. Although it hasn’t moved into my drier areas. I have seen it for sale at Hugh’s Water Garden. I don’t know how it does in a pond.The stems are quite fleshy and if you miss a piece, well now you have a new plant. They also have a smell when pulled, that I don’t care for! Just a word of caution! Thanks, Jeanne! Agreed on the Chameleon Plant — I keep mine contained in a dry hellstrip — but great caution for those with less dry/contained areas.